Research undertaken by the Ministry for Culture and Heritage (MCH) and the New Zealand Defence Force (NZDF) has shown that the total number of New Zealand soldiers who served at Gallipoli in 1915 is certain to have been more than 16,000. This new total number almost doubles the original number of 8,556 soldiers implied by General Sir Ian Hamilton in 1919 in his preface to the New Zealand official war history of the Gallipoli Campaign. MCH Chief Historian Neill Atkinson said the research, which began in November last year, is the most comprehensive investigation ever undertaken into the total numbers of New Zealand soldiers who served at Gallipoli. “Thanks to Archives New Zealand’s digitisation of First World War service records in 2014, the researchers were able to analyse thousands of individual military service files but soon discovered there were limitations to these types of records. “First World War military service files recorded a soldier’s military career, movements between units, and illnesses, but were less concerned with placing them in a particular campaign or theatre of war. Sometimes that ‘Gallipoli box’ simply wasn’t checked,” said Mr Atkinson. Further analysis of unit movements and official war diaries gave a much better understanding of Gallipoli service, but NZDF Historian John Crawford was certain there must have been other records maintained of unit strength, departure of casualties and arrival of reinforcements. John Crawford with the notebooks. Crown Copyright © NZDF. Some Rights Reserved. 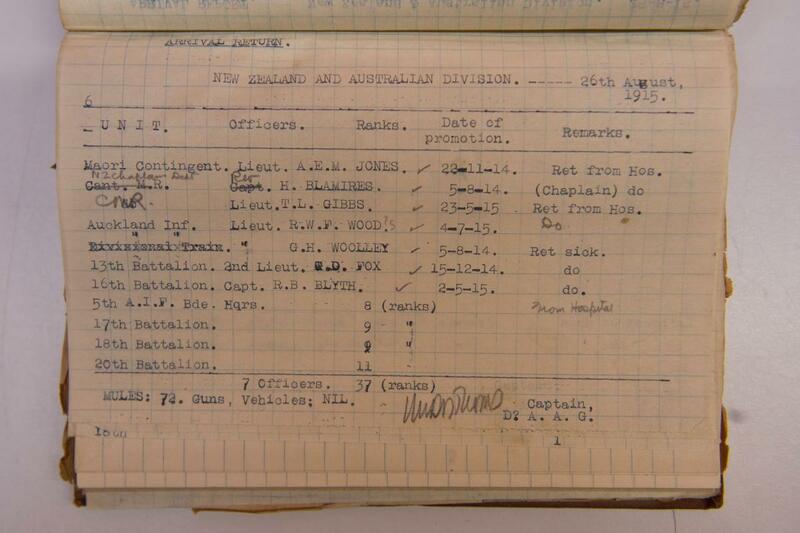 The major breakthrough came in January this year when Mr Crawford discovered the notebooks of the Deputy Assistant Adjutant General (DAAG) of the Australian and New Zealand Division in Archives New Zealand. 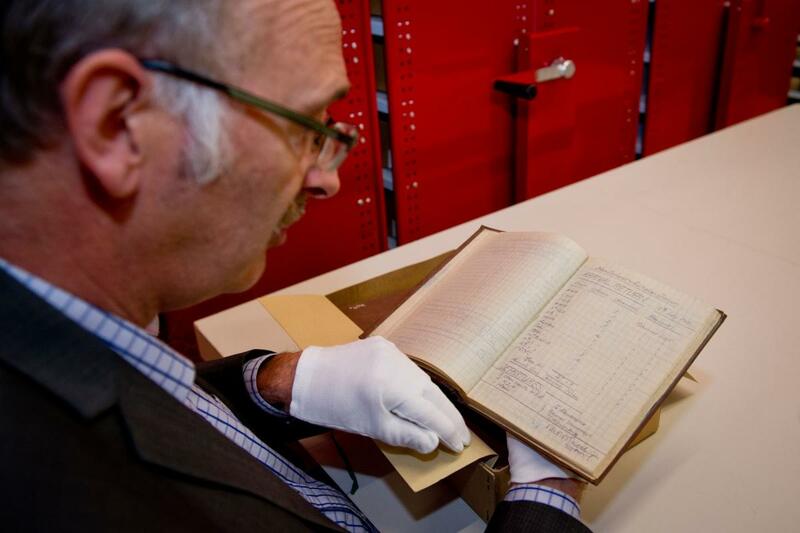 “These meticulously kept records detail the movements of Australian and New Zealand Division soldiers on and off the Peninsula during June, July and August 1915 and meant we could calculate the total numbers with a much higher accuracy,” Mr Crawford said. The research initially looked at 2,429 service records of the 6th Reinforcements, the last reinforcement to reach Egypt before the end of the 1915 Gallipoli campaign. This analysis showed that at least 76% of these men served at Gallipoli, but that military service records alone could not provide a definitive answer. The project expanded to cross-reference unit administrative files and to search for other relevant material, including the recently-rediscovered DAAG’s notebooks. The discovery of historic notebooks of the Deputy Assistant Adjutant General from World War One. The notebook discovery was part of one of the most comprehensive research projects to confirm the number of New Zealand soldiers at Gallipoli. A page of one of the notebooks. WA23/3 box 1, item 6 - Arrivals and Departures, August 1915. Crown Copyright © NZDF. Some Rights Reserved. The final figure was reached by adding the results of the 6th Reinforcement research, the numbers estimated to be present in April-May 1915, and the numbers from the DAAG’s notebook research. The research methodology was overseen by Statistics New Zealand. “This figure is by no means final but it’s the most accurate we can achieve using the evidence we have discovered to date,” said Mr Crawford. Mr Atkinson said the project illustrates how knowledge about our history is constantly evolving as new information is discovered and new interpretations are developed. The new research revises the figure of 8,556 soldiers which was for many years widely accepted to have been the number of New Zealand soldiers who served at Gallipoli. The new total figure of more than 16,000 is a conservative estimate as researchers know that more than 20,000 New Zealand soldiers arrived in the Middle East in time to take part in the campaign. The total number who served in Gallipoli may even have exceeded 17,000. How does this research affect medallic recognition or war memorials? The new total does not affect individual medallic entitlement, the National Roll of Honour or listings on war memorials. Individuals who served at Gallipoli have generally already received medallic recognition. However, if descendants wish to investigate further, they should research their ancestor’s service records on www.archway.archives.govt.nz, then, if still in doubt, contact the New Zealand Defence Force’s Personnel Archives and Medals Office http://www.nzdf.mil.nz/personnel-records/nzdf-archives/how-to-find-contact-us.htm. The total number of deaths remains the same at 2,779. How was the original total of 8,556 reached? In his preface to Major Fred Waite’s 1919 official history, The New Zealanders at Gallipoli, General Sir Ian Hamilton wrote that a total of 8,556 soldiers of the New Zealand Expeditionary Force landed on the Gallipoli Peninsula. Few at the time questioned the figure of 8,556, even though the total number of New Zealanders available for service at Gallipoli was much higher. Hamilton seems to have been referring only to the first few units to land at Gallipoli in April-late May 1915. Later in the book, Waite made it clear that this number did not include the reinforcements that were later sent to the peninsula. When was this figure questioned? Since the early 1980s, historians have questioned this figure and how it was calculated. Producing a more definitive estimate, however, was made difficult because of the fragmentary nature and relative inaccessibility of many of the known sources. The digitisation of First World War military service files by Archives New Zealand in 2014 has dramatically increased the number of records that could be easily accessed to address this question. However, military service files cannot provide the whole answer. There are still significant gaps in these records and the new total is a conservative estimate based on both service records and newly-discovered sources. How many reinforcement units went to Gallipoli? A total of six reinforcement contingents embarked from New Zealand for service overseas and arrived in the Middle East in time to serve during the Gallipoli campaign. How many sick or wounded returned to Gallipoli after recuperation? The total number of sick or wounded who were evacuated and then returned to the Gallipoli Peninsula over the period of the Gallipoli campaign (April-December 1915) is unknown. It is now certain, however, that they were greatly outnumbered by new reinforcements arriving from New Zealand via Egypt. The number of returning sick and wounded between June and August 1915 was 1,311; the number of new reinforcements over that same period was 4,332. Nathanial Thoms was born in England on 5 April 1880. He served with the British forces in the South African War between 1900 and 1902. In 1911 he was commissioned as a Lieutenant in the New Zealand Staff Corps. He was amongst a significant group of British officers brought out to New Zealand by Major-General Alexander Godley to help with the establishment of the new military organisation in the Dominion. Thoms was commissioned in the New Zealand Expeditionary Force (NZEF) as a captain on 5 August 1914. He landed on Gallipoli at the start of the campaign and was promoted to major in September 1915. He was the Deputy Assistant Adjutant General of the New Zealand and Australian Division. This important staff post on the headquarters of the division was responsible for personnel matters. As part of this role he was responsible for keeping an accurate record of the division’s strength on a day-by-day basis. Thoms proved to be an excellent staff officer. He received the Military Cross (MC) and was mentioned in dispatches (mid) for his outstanding service at Gallipoli. He held various command and staff post with the New Zealand Division on the Western Front during 1916 and 1917. Thoms continued to distinguish himself. He was mentioned in dispatches on two further occasions and made a Member of the Distinguished Service Order (DSO) in August 1917, in recognition of his valuable work and “exceptional courage and keenness”. He was severely wounded during the Battle of Passchendaele on 4 October 1917 and did not see active service again. Major Thoms returned to the British Army in 1919 and rose to be lieutenant-colonel before resigning in 1931. He commanded the Shanghai Volunteer Corps between 1931 and 1934 and died in Kenya on 24 May 1957.